Now that school is just right around the corner, that means fall is as well. I myself was never particularly fond of the season, but this time I might just change my tune. I cannot wait to try all the fashions for the fall. Two of the big main styles for this season would have to be fur and the 50's. I absolutely love fur and more designers are now working with faux fur. 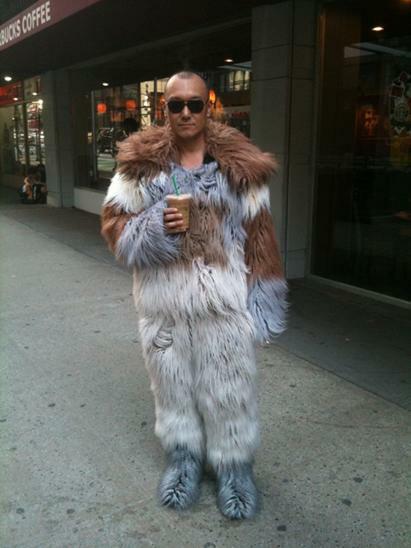 Karl Lagerfeild did full faux fur suits for his line (Joe Zee may be able to rock it, but I think I may have to pass on that.) Prada's 50's inspiration is full out with the big high waisted full skirts and dresses. It even seems that the bee hive is trying to make a comeback as well. I for one am so happy that the lady look is back in full force. No more low rider jeans, but high waisted pencil skirts, wide leg pants and men style clothes instead. Not everyone can afford designer clothing such as Chanel or Prada, so for a budget friendly fashionista like myself, there are many stores you can shop at to achieve these looks. H&M is a great store for all the latest looks and styles. All the prices are amazingly affordable and can fit any wallet size. Also, vintage and thrift stores are a great place to find hidden gems. A lot of these stores will have pieces from the 50's that you can mix and match things with. Some of the big must haves for this fall season would be trench coats, leather, and boots. A trench coat is great and it can be carried through season after season. Burberry has some amazing ones this year as well as Banana Republic and H&M. Leather jackets are awesome and can literally be paired with anything and everything. You can throw it over a blouse and pencil skirt to rough up the look or go for the classic vintage band tee and jeans. As far as our feet Over The Knee boots are still very big this season along with clogs and kitten heels. Now I will be the first to say I am not a fan of the kitten heel. They tend to hurt the feet more than a higher heel would. Also, you want to watch where you buy your shoes. Never settle for less. We all may not be able to afford Manolo's but there are many other stores that sell well made shoes. Aldo is one of my favorites. It can have some awesome prices and all the big trends for the seasons. There is nothing worse than a poorly made shoe. My favourite things about this season are all the amazing new fashions and all the big September issues. What is your favorite part and what trends are you most excited for?